Easington Sports are hunting for success on all fronts this season. Promotion – and the UHLSport Hellenic League title – remains the priority but Sports are now through to the last four in two cup competitions. 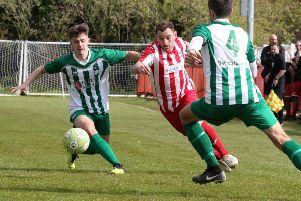 Sports are through to quarter-finals of the Bluefin Sports Challenge Cup in which they face a trip to Division One East leaders Burnham and they edged out Almondsbury 1-0 thanks to a late own goal in Saturday’s Division One West Subsidiary Cup clash at Addison Road. The game got off to a great start with both teams looking to stretch defences. Andrew Stidder shot over the keeper but hit the far upright before Scully Rogers reacted to a half clearance on the edge of the box but his shot rebounded off the post before anybody could follow up. Stidder was at the heart of further opportunities for Sports, he drifted into the box from his wide position to find Connor Grant who was denied by keeper Jamie Merry. Mike Spaull’s cross found Stidder who could only head against the post. The last chance of the half fell to the visitors when winger Dan Lane cut the ball back to the far post where Nick Rugman tapped in but was ruled offside. The visitors carried on where they left off after the restart and Rugman’s lob saw Adam Rimmer collect with ease while Sports found it much harder to test Merry in the second half. Sports kept the ball well but a slower pace to the game meant that the experienced back four managed the game well. Apart from a few half chances, the best effort of the half came on the hour mark. Grant picked the ball up in his own half and attacked at pace down the left hand side before cutting in to shoot. Grant was tackled on the edge of the box but the ball fell kindly for Spaull who rattled the bar again. Sports eventually broke the resolute Almondsbury defence down late in the game. Substitute Henry Rose crossed into the box and a defender glanced the ball over Merry into the empty net. Sports saw the game out with the only chance falling to Keelan Mastouras who cut inside but Rimmer tipped his shot over the bar. Sports have a Division One West double-header this weekend as they look to regain top spot from Cheltenham Saracens. They entertain Malmesbury Victoria on Saturday and two days later make the short trip to Kidlington Development.